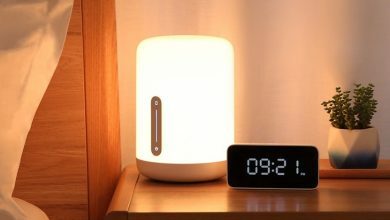 Today we are introducing a new product from Mijia, that is Mijia MJCTD02YL LED Bedside Lamp. With a colorful atmosphere, this beside lamp combines the sense of technology with home. Let’s take a closer look at it. The Mijia MJCTD02YL LED Bedside Lamp adopts white, simple and round shape, which makes the light range wider. With a high-difficult inverted mold and hot runner design, the lamp can illuminate evenly. The lampshade is made of white acrylic material and has a brightness of up to 400 lumens. That is very nice for normal lighting in the bedroom. There is a vertical operation panel on the front of the lamp for operation. When the light is off, you can touch any position of the brightness panel to turn on the light, which is convenient for operation at night. At the bottom of the Mijia MJCTD02YL is a three-stage silicone anti-skid pad design, which enhances the anti-slip effect and is firm and reliable for various placing. Mijia MJCTD02YL LED Bedside Lamp can be controlled by Mijia APP, which is compatible with Mijia intelligent platform and can be interoperable with other products. The lamp also works with Apple Homekit for remote control, that means you can use the iPhone, iPad, Apple Watch, and Siri on your Mac to easily control with a tap, voice, and even automated settings. The Mijia lamp is equipped with the top-to-line brand lamp beads and a double-layer lampshade, that can deliver even and bloom colorful light. It colorful soft light can create a romantic atmosphere for your bedroom. As we mentioned above, the lamp’s brightness level is up to 400 lumens for normal lighting. And its minimum brightness is less than 2 lumens, that is very soft so you can use it as an auxiliary light while sleep. Brightness level from 2 to 400 lumen can still offer good lighting to adapt to various situations.